While this is endless fun, most everyone recognizes the inherent impossibility of ever producing conclusive answers. There are just so many ways in which the conditions faced by one generation of players were very, very different from those of another: ballparks, equipment, tactics, techniques, conditioning, nutrition, medicine, quality of competition, and on and on. The further apart in time two players are, the more problematic the issue becomes. It becomes really perplexing to decide, for example, if Albert Pujols is better than Cap Anson. I have no illusion of being able to offer a definitive solution to this perpetual dilemma. But I’d like to present an illustration of a little technique I’ve had fun with over the years that, perhaps, sheds some light on the murky challenges of cross-era player comparisons. Let’s call it the Baseball Time Machine. The rules of the exercise go like this: take a player, any player. Make the assumption that his exact genetic clone — the same DNA — appeared on the planet in an era far removed from the one in which he actually played. Make the further assumption that this time-transported kid grew up to become a big league ballplayer, as did the original. Then apply everything we know about (a) the innate physical and mental qualities of the player and (b) the conditions of the both his actual era and the new one we’ve plopped him into, and come up with our best depiction of just what kind of a career the guy would have. How well or poorly would he do, competing against the different players, under the different conditions? Does this make sense, or have I totally confused you? Hmmm … okay, I do that a lot. (I know this because my wife tells me so.) All right, then, how about this: we’ll run through one here together. Why don’t we take a ride in the Time Machine with, say, Honus Wagner? John Peter Wagner was born February 24, 1874, to German immigrant parents near what is now known as Carnegie, Pennsylvania. He was bilingual, and would for all his life be familiarly known by the nickname “Honus” (pronounced hah-ness, not hoe-ness), a derivation of Johannes or Hans, German forms of the name John. He quit school at the age of 12, and found work (when he wasn’t playing baseball) in the local mines and steel mills — but this isn’t an indication that the Wagner family was poverty-stricken; kids working by the age of 12 wasn’t unusual among the working class in the 1880s. All indications are that Honus’ early life, while by no means luxurious, was pleasant enough when understood within the context of the time and place. Performing hard physical labor from a young age, as well as constantly playing ball, the adolescent Honus developed a very powerful upper body. He became a star, the best of the Wagner boys, in the local semi-pro and industrial leagues. In the spring of 1895, at the age of 21 — 5-foot-11 and demonstrating a barrel-chested physique that would see him develop into 200 fat-free pounds in his prime — he made baseball his “day job,” turning fully pro by accepting an offer from the minor league ballclub in Steubenville, Ohio. Let’s say Honus Wagner was born 90 years later than he really was: not in 1874, but in 1964. “John Peter” would be a perfectly normal name for 1964, so there’s no reason for us to give him any other name than that. Bright and well behaved, Johnny had no problems in school, but took more interest in sports — particularly Little League baseball — than he did in schoolwork. The family had five boys, all of them jocks, but Johnny emerged as the most impressive athlete. As a youngster, the burly Johnny was tried out in several positions by his Little League coaches, but tended to play where the best (right-handed throwing) young athletes often play: shortstop. Focusing on sports and being carefully coached from a young age, the adolescent Johnny developed not only an imposing physique, but tremendous skills. By the time of his high school graduation in 1982, he was nationally recognized as an exceptional baseball prospect (and football scouts were keenly interested in him as a running back). On the advice of his parents, Johnny accepted a baseball scholarship from a Pennsylvania university. By his sophomore year he was the starting shortstop on the varsity team. In the spring of 1985, his junior year, at the age of 21 — 6-foot-1, and demonstrating a barrel-chested physique that would see him develop into 210 fat-free pounds in his prime — he committed to a baseball career, by allowing himself to be submitted to the major league draft. He was selected by the Pittsburgh Pirates’ organization. Honus’ hitting was sensational from the beginning of his minor league career. Playing shortstop, his terrific offensive performance propelled him through no fewer than four different minor leagues in 1895; he hit no lower than .365 at any level. In 1896, at the age of 22, he landed in the Atlantic League — a level roughly equivalent to Triple-A today — and although there was no question about his hitting potential, at this level of competition Honus was moved leftward on the defensive spectrum: he played first base, third base, and the outfield in 1896, while hitting .349. Then he was made a full-time third baseman in the Atlantic League for 1897. Whatever his defensive development, by mid-1897 his Atlantic League hitting prowess was such (batting average of .379) that he was acquired by the Louisville Colonels of the National League. The Colonels, liking Honus’ bat and his strong arm, put him in right field. He stepped in as a regular there and was a solid major league hitter from the start, with a batting average of .338 and an OPS+ of 126. In 1898 and 1899, at ages 24-25, Honus settled in as an outstanding regular, demonstrating the ability to hit for both average and power, and showing excellent speed. He hit .299 and .336, with OPS+ performances of 116 and 142. He was fifth in the league in slugging in 1899. However, he remained uncommitted as a fielder, being rotated between first base, third base, and right field. As he approached his 26th birthday, Honus was a major leaguer with great physical tools — arm, speed, hands, and bat — an emerging star, but not established with a regular defensive position. Johnny’s hitting was excellent from the beginning of his minor league career. Playing shortstop, his strong offensive performance propelled him from Single-A to Double-A in 1985; he hit around .300 with doubles-and-some-homers-power at both levels, and stole 27 bases. In 1986, at the age of 22, he was promoted to Vancouver in the Pacific Coast League, the Pirates’ Triple-A team. Although there was no question about his hitting potential, at this level of competition Johnny was moved leftward on the defensive spectrum, to third base and some right field. He was brought up to the majors for a late-season trial in September 1986, and then began the 1987 season at Vancouver as a full-time third baseman. Whatever his defensive development, by mid-1987 his PCL hitting prowess was such (hitting over .300 with good power) that Pittsburgh brought him up to the majors to stay. The Pirates, liking Johnny’s bat and his strong arm, used him at both right field and third base (weighing their options between Johnny and Bobby Bonilla). He was a solid major league hitter from the start, with a batting average of .298 and an OPS+ of 117, and showing fine speed for a big guy. In 1988, at age 24, Pittsburgh decided upon Johnny as the better third baseman than Bonilla — based on his superior range and hands — and committed to him there. He settled in as a full-time player over the next two years, delivering batting averages of .279 and .306, and OPS+ performances of 111 and 129. In 1989 he led the league with 12 triples, and hit 18 homers, and was 10th in the league in SLG. As he approached his 26th birthday, Johnny was established as a young star, with great physical tools — arm, speed, hands, and ability to hit for both average and power, and was locked in as a third baseman. In 1900, at 26, Honus had his breakout season. Installed full-time in right field for Pittsburgh (the Louisville franchise disbanded after 1899, and the core of the team was transferred to the Pirates), he led the league in doubles, triples, batting average, and slugging average, posting a 175 OPS+. He was a major star. Over the next two seasons, Honus sustained his terrific offense, firmly establishing himself as one of the league’s elite hitters for average and power, and leading the league in stolen bases both years. Yet the Pirates still didn’t commit him to a regular defensive position. He continued to play the outfield, but was also used at third base and first base. And, for the first time at the major league level, Honus played shortstop, in 61 games in 1901 and 44 games in 1902. Finally, in 1903, manager Fred Clarke settled on the 29-year-old Honus as his full-time shortstop. Honus would remain the Pirates’ regular shortstop until he was well past 40; while he was probably never a great defensive shortstop, there’s every indication that his speed and arm, and his impeccable conditioning (Honus regularly worked out with weights, something nearly unheard of among baseball players), allowed him to perform quite well there. Throughout his 30s, Honus sustained a tremendous level of offensive production. He regularly led the league, or came close, in every category except bases on balls. He had his best season at age 34, in the very low-scoring year of 1908, leading the league in hits, total bases, doubles, triples, RBIs, stolen bases, batting average, slugging average, and on-base percentage, and finishing second in homers and runs scored. His OPS+ that year was 205. In 1913, at age 39, Honus was bothered by injuries. Over the next few years he played some first base and third base, although remaining primarily a shortstop through age 42 — he became the oldest regular shortstop in all of major league history, a feat matched only by Luke Appling. Honus then closed out his playing career (as would Appling) with a season as a 43-year-old utility infielder. One estimate puts him as the most beloved player in baseball during the time between King Kelly and Babe Ruth. If so, he deserved the adoration. He always had time for a friend; he helped rookies; he had a drink now and then, but he was never a drunk; he was brighter than most but suffered fools with patience; and he never, never, acted the star. He also refused to let a cigarette company put his picture in their packs because he didn’t want to encourage kids to smoke. In 1990, at 26, Johnny had his breakout season. He won his first of six Gold Gloves at third base, and he hit .331 with 39 doubles and 25 homers (with an OPS+ of 152), and stole a career-high 32 bases. He was a major star. Over the next 10 seasons, Johnny sustained his terrific all-around play. He was consistently among the better hitters in the league for both average and power. He had his best season at age 34, in the very high-scoring year of 1998, hitting .348 with 47 homers, and beating out Sammy Sosa and Mark McGwire for the NL MVP award. His OPS+ that year was 173. In 2003, at age 39, Johnny was bothered by injuries, and was shifted to first base. 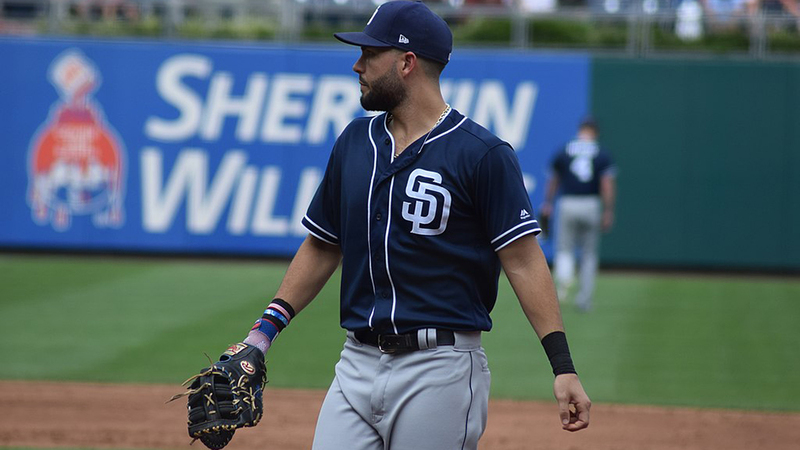 Now 40 years old, he remains in impeccable condition, and there’s every indication he will be a productive platoon first baseman for at least a year or two to come. He was the best all-around third baseman in baseball for a period of at least 10 years, and will almost certainly become a first-ballot Hall of Famer. Moreover, throughout his career, Johnny has been one of the most respected players in baseball, extremely popular with fans and fellow players alike. He’s always taken the time to sign autographs, and participate in youth baseball clinics. His great reputation and genial personality has given him a robust second income as a product endorser and corporate pitchman, but he’s very scrupulous about how his name and image are used, striving always to ensure that he remains a positive role model for kids. He’s become hugely famous and wealthy, yet has never been involved in any kind of scandal or controversy. OK, let’s step out of the Time Machine and recap our journey. Transported to the modern era, Honus Wagner would encounter very different conditions in childhood and adolescence. Better nutrition, and inoculation from childhood illnesses, would allow him to grow a bit bigger and taller than he actually did. Participation in better organized baseball programs from a young age, with more sophisticated instruction and coaching, would allow him to develop even better skills than he actually did. These factors would make Johnny Wagner an even better baseball player than Honus Wagner. But Johnny would be competing within a vastly larger, more diverse, and better organized pool of talent than Honus; Major League Baseball today draws from a feeder population (both in the US and beyond its borders) many times larger than it did in Honus’ time. Johnny, while intrinsically a better specimen than Honus, wouldn’t be able to stand out among his peers quite as brightly. I’ve reduced Johnny’s OPS+ figures by a factor of 30% off those of Honus; this is just a wild guess, but it’s my estimate of the degree to which the overall improvement in the level of major league competition since Honus’ era has reduced the extent to which stars dominate average players. The style of Major League Baseball that Johnny would play is also very different from Honus’. Johnny wouldn’t make a rightward shift on the defensive spectrum at age 29, especially not to shortstop; players today are typically committed to positions earlier and more firmly. An athlete of Wagner’s build and skill profile today would probably be a third baseman, and a very good one. Most definitely, Johnny would focus his offense much more around power than line-drive hitting and speed than Honus did — and Wagner’s physical attributes were such that the long ball would be something to which he’d readily adapt. Honus’ commitment to conditioning, and especially weight training, was exceptional, but those habits wouldn’t make Johnny unusual. So that’s the Baseball Time Machine: an exercise that requires us to account for, and attempt to assess the impact of, the many changes in conditions across distant eras. Did I get everything right with Johnny Wagner? Who knows? But I doubt I’m very far off. It’s fun, and it’s a way to think seriously about the conditions that shape players’ careers, as well consider how players respond to the conditions they face. In Wagner’s case, for example, we’re able to imagine him as a modern TV icon and multi-millionaire superstar, yet avoiding “any kind of scandal or controversy.” In this way Johnny Wagner’s career stands in stark contrast to two of his contemporary superstars, whom we’ll encounter in future rides in the Time Machine: Toby Cobb (born 1966) and Greg Ruth (born 1965). Thanks to Nathan Kunkel, a frequent poster on BaseballPrimer.com, for suggesting that I develop this idea into an article. Wagner’s minor league statistics were found in my trusty old Sporting News Daguerreotypes book. Biographical information was found in Fred Lieb’s history of the Pittsburgh Pirates that appears in The National League, edited by Ed Fitzgerald (New York: Grosset & Dunlap, 1966), as well as in the Holway and Carroll article in Total Baseball, edited by John Thorn, Pete Palmer, Michael Gershman, and David Pietrusza (New York: Viking, 1997). My esteemed colleague Studes presents a very interesting and informative look at Herr Wagner here.